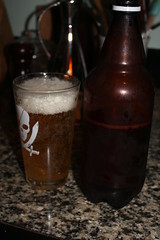 Well, the first batch of home brew - the requisites bits for which were given to me on my birthday - is done. Here it is, looking fairly beer-like and wholesome. It is, however, not very good. At first opening it was entirely too sweet, which means secondary fermentation, which occurs in the bottle, hadn't completed. I let it sit another week, and one of the bottles exploded. This was sort of alarming, as it took us a while to figure out what had happened to cause the weird noise in the kitchen. Normally it would be Blink, but he was in the room with us. So last night nephandi and I opened up a bottle after another week to condition, and then a couple of days in the fridge. It was like Karnak, or Mega-Mind, in that it had a positively enormous head. A bit like a sputnik - large in some parts and spikey in others. A virtual planetoid. I think that's what I'll call it. I poured myself two pints of nothing but foam until I finally got to some beer. What I arrived at was a bit murky (appropriate for a whitbier) with a fairly simple flavor, masked by a bit too much sweetness. Basically I put too much sugar in the bottles when I bottled it, and it's too foamy and still too sweet. It's drinkable, but it's not great - and the head is really, really out of control. Fortunately I used substantially less sugar in the cider I recently bottled, so that should turn out just right, I hope.